Gillian Evans, Chair of the British Psychological Society's Safeguarding Advisory Group, on their new guidance. Children have the right to be healthy and safe; to be happy and achieve their own potential; to make a positive contribution to society and to experience economic wellbeing. Safeguarding now spans a horizon that ranges from prevention to crisis intervention. It has broadened its reach to include wellbeing and safety across a range of environments, settings and systems. As professional psychologists, we need to match this breadth of thinking. To that end, the British Psychological Society’s Safeguarding Advisory Group has published new guidance, Safeguarding Children and Young People: Every Psychologist’s Responsibility. We encourage psychologists to broaden their perspectives, to incorporate areas that they may not normally consider, including issues around power. 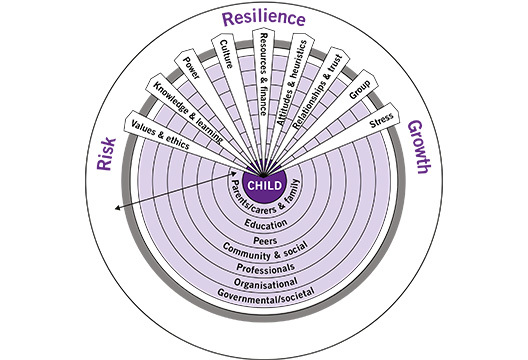 Our model considers layers (such as family, education, peers, community, professional, organisational, societal), and factors impacting the child across those layers (such as values, knowledge, power, attitudes, relationships, stress). Psychologists can think about the level of individual intervention, but should also be aware that working at an organisational level within a variety of contexts may afford the opportunity to help influence key decision makers at community, regional or national level. We’re trying to encourage people to move away from models of pathology for individual children and families, and also from a sense of clinical fatalism about recovery. Systems can become more or less safe and healthy, and our input can be critical. Psychologists are privileged to work with people in a multitude of settings, across the lifespan, and may work with people at a time when they are facing some of the greatest hardships of their lives. The profession has much to offer and should be both ambitious and confident about influencing safeguarding in society, and to influence policy makers, who can change circumstances at a population level. The Society is taking a more active role in this, with an impact statement based squarely on making the world a better place. Your contribution counts, whatever your specialism. Improved human rights for the children of today, will ensure that the world is fairer, safer and healthier for the future. Please download the document via www.bps.org.uk/news-and-policy/safeguarding-children-and-young-people-ev... (available from 1 June) and let us know your thoughts.